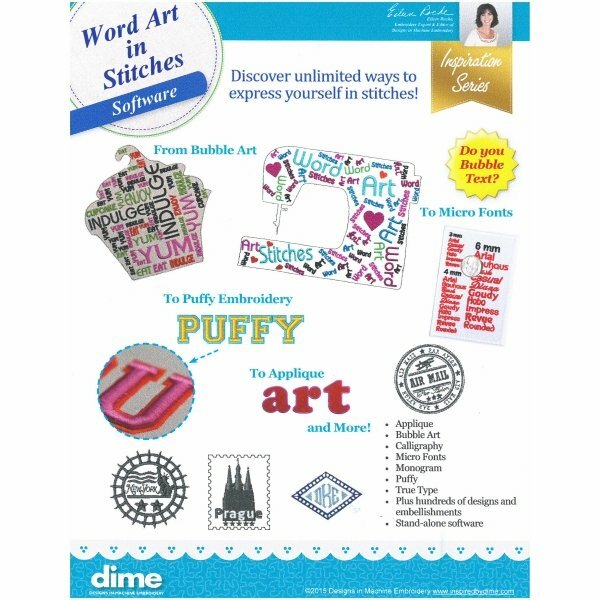 ​Using DIME's program Word Art in Stitches you will create a different design each month using DIME's newest software program. March: We will learn to use the Artwork and Bubble Text tool, use the Text tool and True Type font tool and work with their properties. April: We will use the Text tool and learn to import a design. Use the alignment and rotation tool. May: We will create a gift tag to attach to the "End of the Year" gift for a special teacher using imported fonts, the Artwork and Bubble text tool and their properties. June: We will create a simple Friends & Family towel using the Text tool and it's properties and the Text Designs. We work with the Group/Ungroup tool, changing colors, and in the Sequence tab separating color sections. A working copy of the program loaded onto your computer and a note book.